Simpsons has been ever present on the Birmingham food scene for some time, held a Michelin star in the city since 2000. It is out in Edgbaston, a little away from the very centre of the city and has recently undergone a refurbishment within the grand Georgian house that the restaurant inhabits. The main dining area is a very attractive space set in a conservatory, light and with windows into the busy kitchen. For lunch there were 3 menus on offer, a full tasting menu, an a la carte and a cheaper lunch offering. We chose the full tasting menu of 6 courses. The first food that came our way was a couple of nibbles that were very well presented, a seafood cracker with cod roe mousse the one that stood out. Equally beautiful was the first course of cured trout, the fish beautifully fresh and in harmony with the bright beetroot and warmth of some horseradish. The dish of the meal arrived next, a modest cup of crab risotto that was beautiful sweet with the white crab meat and a few brown shrimps a more savoury note. 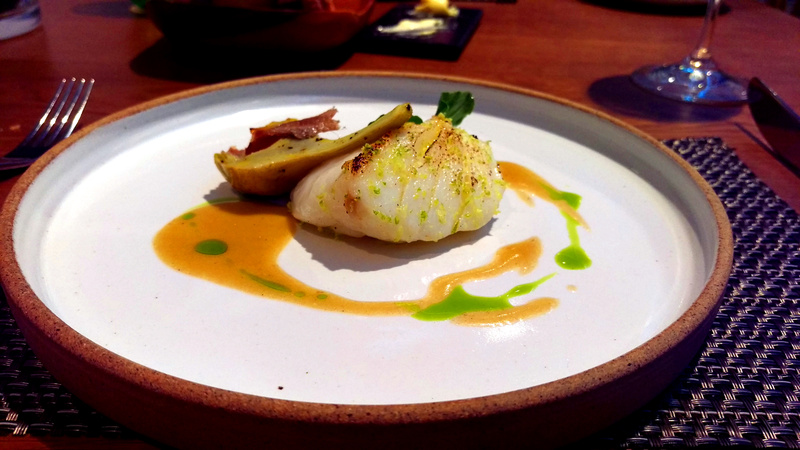 F0llowing that was a minimalist affair with a plump fillet of cod, simply served with an artichoke. Again pretty on the plate but flavours here weren’t as prominent, a nice dish but lacking something, be it in texture or taste. Next up was a comforting dish of duck egg, bacon and cep mushroom cream. Simple, classic flavours done well. Equally welcome on a cold winter’s day was slow cooked Ox cheek with pearl barley. A powerful onion puree bought a depth to the plate with a few grapes some sweetness to cut through the salty meat and barley. 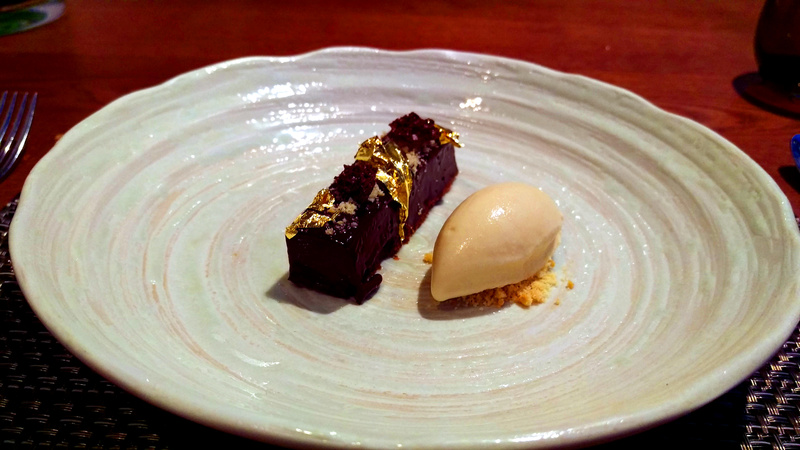 Dessert was a luxurious bar of chocolate bar, served with a little quenelle of cookie flavoured ice cream. Just on the right side of being too rich. There was a cheese option proffered for an additional cost but we felt we’d had enough food. The refurbishments at Simpsons have certainly resulted in one of the nicest dining rooms I have eaten in for a while. Having said that the food here didn’t quite live up to the high standards set by their interior designer. There wasn’t much to fault but there equally there were few memorable dishes. What was also notable was a lack of ‘luxury’ ingredients. At £85 for this tasting menu I felt it was a little steep for what was ultimately delivered, when I’m shelling out £150 including a modest bottle of wine and service I expect that little bit more. For £10 more at Sat Bains or Nathan Outlaw you get 10 courses and cooking that is a step above Simpsons.